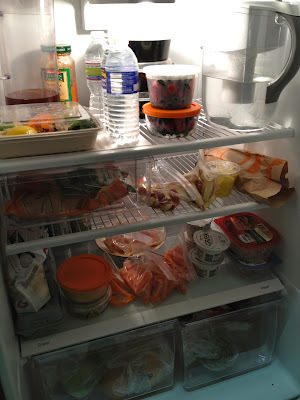 With a lifestyle makeover must come a refrigerator make over... After years of loving cheeses, carbohydrates, and flavored drinks (not to mention alcohol, junk food, and other fatty substances) my refrigerator has become a safe haven for my body, metabolism, mind, and health. I'm not saying any of this has been easy, but it all has [and will be] worth it. Water - TONS of water. The remains of a crystal light tea in the back left are for/from Nick. Remember that although he is very supportive, Nick has been responsible with his eating and doesn't have to re-structure his diet quite like I do. Fruit - Berries, apples, citrus, grapes; all great fruit options for someone beginning a diet. The pineapple chunks are again Nick's, as pineapple and melons are two examples of fruits that contain much higher sugar counts and aren't recommended while beginning a body flush. I've pre packaged the fruits, veggies, and salads into individual containers to make them easily accessible for our on-the-go lifestyle (even used the pre-packaged peppers and carrots while traveling to-and-from Penn State during a car trip), and as stated before, it's making the world of a difference. It's taking some time to clean, cut, and prep our healthy meals in advance, but it's going to pay off. I just know it!